Twitch is pleased to bring you the complete E3 2014 experience from wherever you are! This is our first year as the official streaming platform of E3 and we've made sure you won't miss a second of the awesome developer talks, panels, game demos, announcements, and more that will all go down this week. /Twitch - The main event channel and location of all major press conferences. We'll be broadcasting nonstop content from the show floor hosted by Marcus “djWHEAT” Graham, Jon Carnage and Jordan “Soma” Tayer from Twitch, as well as notable personalities Swiftor, MANvsGAME, Seltzer_FD, and TheJustinFlynn. E3 Event Page - This all-in-one event page contains links to both the main event channel and all other major channels that will be broadcasting from the event, including the official Nintendo, Playstation, and Xbox channels and major media channels like GameSpot, Machinima, and more. While you're watching, help us improve the lives of children through video games. 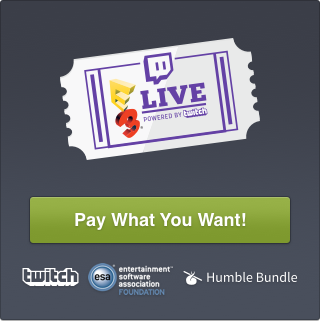 Twitch and Humble Bundle have activated our Wonder Twin powers to come up with an amazing bundle of digital goodies to support the ESA Foundation (ESAF). Pay whatever you want, receive some awesome games and content, and feel good about helping a great cause!